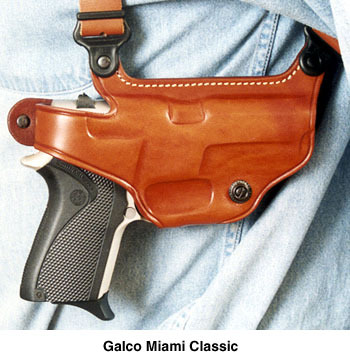 discovered that Galco had brought out a new model shoulder rig, “The Classic Lite.” This new model has two very attractive properties: it costs less than half what a Miami Classic does, and its spare ammo carrier is two flat pouches designed for loose cartridges or Bianchi Strips. 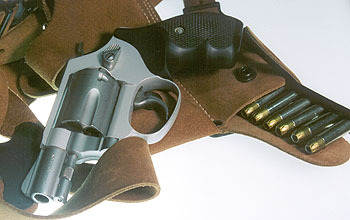 Now, for a tactical reload on a revolver, I much prefer speed loaders, but the double speedloader pouch design of the Miami Classic for revolvers is like having a couple of tennis balls under your right arm. The flat ammo pouches are more comfortable to wear. I would recommend that you carry a couple of speedloaders in belt pouches or pockets if you were to use this rig. I have some issues with shoulder holsters. I don’t think the draw is near as smooth and fast as that from a belt holsters. You have to leave your jacket on all the time when you’re wearing a shoulder rig and that can get hot in warm climates, although an oversized shirt over a T-shirt can cover the shoulder rig when it’s hot. Also, your covering garment needs to be fairly loose or the gun will print. The shoulder holster also has some benefits. It rides in a way that is similar to a cross-draw holster, and it is a good solution for people who spend a lot of time seated or driving in cars. I have found that I like the shoulder rig for long car trips. So why didn’t I just get an outside-the-belt holster for the little snub-nose? The answer to that is pain. The pain in my lower back was so bad that simply tightening my belt enough to hold up my pants could trigger nausea. It was bad. Wearing anything on my belt was just out of the question. I’m happy to report that the back has largely healed up and I’m back to wearing my IWB and OWB holsters that I prefer. Since my back healed up, I have used the Classic Lite once, and that was for a car trip. As I projected, the holster lives most of the time in the drawer. So how does Galco build a shoulder rig for half the price of the Miami Classic? Well, it’s really pretty easy. The holster is leather, fairly thin, at about 1/8″ thick. The construction is “floppy.” It’s not molded and boned to fit the gun closely in the way the Miami Classic is, but the dimensions are correct so that the gun is held quite securely. 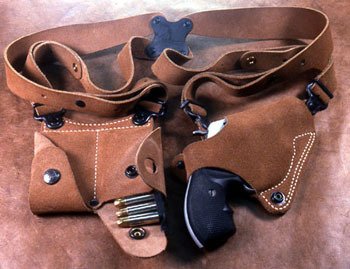 The finish is suede on both sides rather than the polished finish of the more expensive holsters. It has all of the same hardware as the other Galco holsters. It’s a nice little holster. I’d say it is $60 worth of work. If you only wear a shoulder rig occasionally, or maybe want to try one without investing a whole lot of money in a top shelf rig before you know if you’re going to like it, the Classic Lite might be just the ticket for you. For me, it fulfilled its mission: it was light enough and kept the pressure away from the painful areas of my back so that I could carry until the injury healed up.